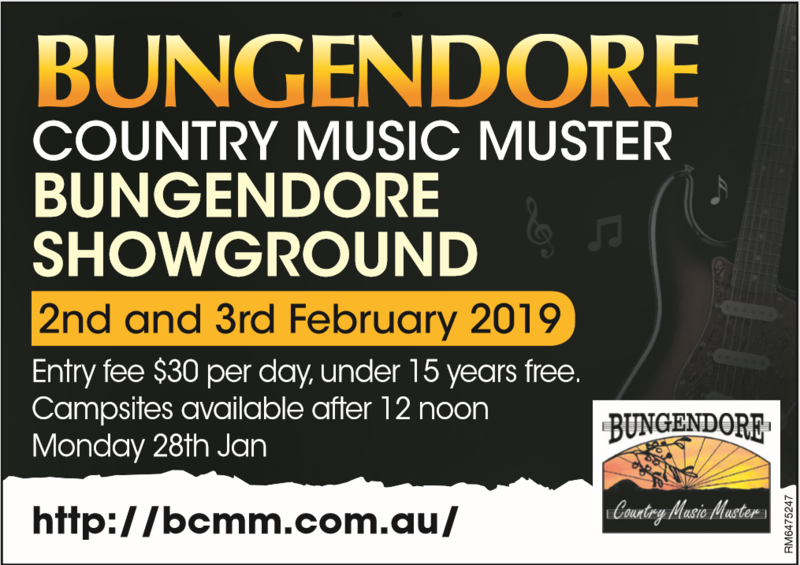 The artists for the 34th annual Bungendore Country Music Muster have now been finalised and it is going to be a fantastic weekend of Aussie country music. Guest artists for the 2019 muster include multiple golden guitar winner Pete Denahy and entertainer Rodney Vincent bringing to the stage his unique blend of country, comedy and story telling that never fails to entertain. There is a fantastic line up of Australian bush balladeers including the wonderful Owen Blundell, Keith Jamieson, and Ernie Constance, Di Lindsay and Peter Simpson, Justin Standley, Brian Letton, Jed & Trudy Hintz, Terry Gordon, Kate Daniel & Alisha Smith. Supporting the artists and entertainers in their own right are two great Country Music Bands, The Bungendore Muster Band led by Lindsay Waddington, and the ever popular Peter Coad and the Coad Sister’s Band. We are also pleased to announce the finalists of the 22nd Annual Stan Coster Memorial Australian Bush Ballad Awards for the 2019 Muster. Once again the awards attracted nominations from the very best Australian country artists and the judges were set a real challenge to decide the finalists. Winners in the eight categories will be announced and finalists will be performing at the Stan Coster Australian Bush Ballad Awards being held at 8pm on Saturday night of the muster. This year the Muster also recognises three outstanding Bush Balladeers at a plaque ceremony being held at 3pm on Friday 1st February at Bush Balladeers Place Bungendore Park. All are welcome to join us to celebrate the outstanding contribution made by Owen Blundell, Keith Jamieson & Ernie Constance to the Australian Bush Balladeer industry of Australia and the Bungendore Country Music Muster over many years. The Bungendore Showground opens at 12pm on Monday 28th January for campers and caravans with a full week of walk ups for campers and invited artists leading up to the festival. There is also the poet’s breakfast from Tuesday to Saturday and other fun activities including bingo, and the muster sausage sizzle. The muster weekend kicks off on Saturday the 2nd of February when the village of Bungendore hosts the Muster busking competition with $1000 in prize money and the opportunity to appear on the muster stage. In the afternoon the music moves to the showground for the 1pm start of the all Australian Country Music Festival with an exciting line-up of Australia’s country music artists and musicians. At 8pm the much awaited Stan Coster Awards commence. On Sunday the 3rd from 10am, award winners and guest artists return to the stage for the gala showcase with entertainment right through to 6pm. Bungendore is located just outside of the nation’s capital in a beautiful valley in the Southern Tablelands near Lake George. While enjoying camping in the country surrounds of Bungendore, festival goers can also enjoy everything that the region has to offer including award winning wineries and restaurants and the must see Bungendore Wood Works Gallery. Visitors can also enjoy the Southern Harvest Farmers Markets which will be open on Saturday morning in in the Saint Philips Church grounds Bungendore, selling regional food including fresh meat and vegetables, honey, eggs and lots more… A Family Hoedown is also planned to follow the markets on Saturday afternoon and promises lots of fun for Bungendore locals and visiting families to celebrate the Muster weekend. Local venues, hotels & clubs are also getting into the spirit and we can’t wait to see you there. On the Saturday of the Muster Weekend the village of Bungendore hosts the Signflair Busking Competition with $1000 in prize money to be won. The competition runs from 9am to midday and is open to all non-professional buskers. Entry fee of $10.00. If you would like to join us in bringing to life this wonderful event please contact us.